Ask a Republican legislator and they'll speak of their efforts to take back both chambers and the governor’s office to "fix" what’s been done by the Democrats. 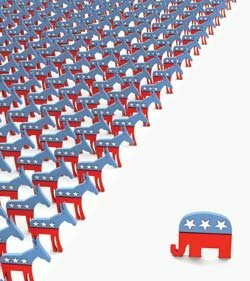 An analysis by the New York Times found 36 states are now controlled entirely by a single political party—the largest number of one-party ruled states in six decades. Connecticut is one of 13 states controlled by Democrats, compared to 23 run by Republicans. States are continuing to decide issues that members of Congress can't agree on—but the extreme polarization also means states are moving further and further apart. Representatives those states send to Washington, D.C., have also become more polarized. One-party rule is the current lay of the land here—but an added dynamic is geography. Situated in cozy New England and among the historically blue states of Massachusetts, Rhode Island, Vermont and New York, Connecticut has the advantage of being surrounded by states with the same mindset. If a Republican won the governor’s race, the party will need four more seats in the Senate to flip at least one chamber. "This is doable," says David Labriola, CT Representative. "I believe momentum is growing for a big course change in Connecticut because people are focusing." (There is always the next election cycle in 2016 to flip the Senate in favor of the GOP and restore CT from last place among the states in tax and spend. See the full connecticutmag.com article.